Coming off the slide scanner this time we have a few blue images. 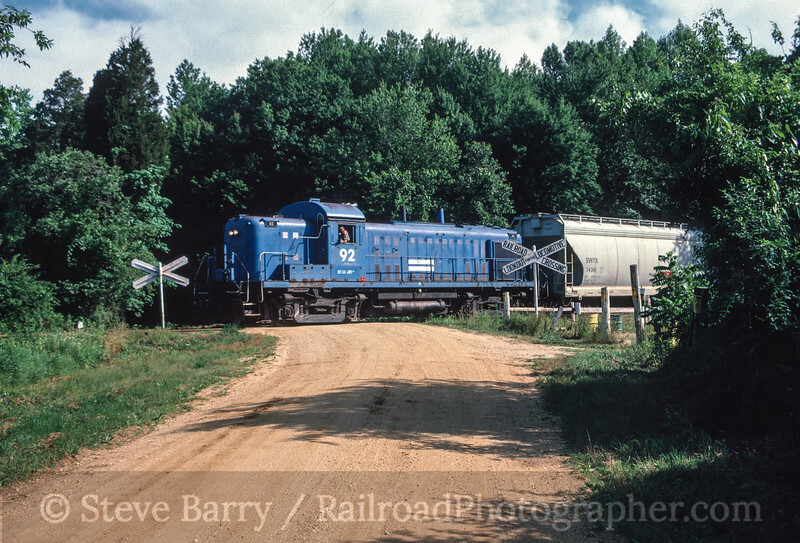 The Conrail SD80MACs were the coolest things going when new. Sporting more white trim than the typical Conrail locomotive, these units from Electro-Motive Division of GM were mostly put into coal service. 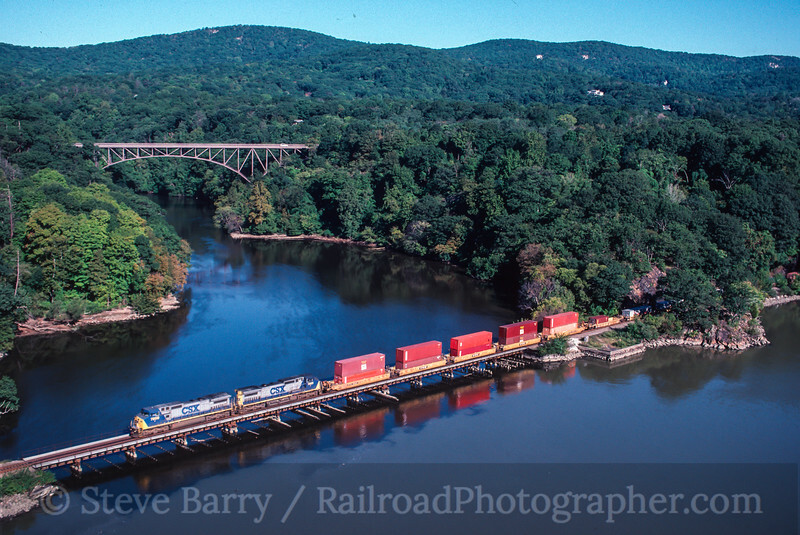 Here we see a train entering Enola Yard across the Susquehanna River from Harrisburg, Penn., on May 19, 1996. Next up we're at Mannington, N.J., on the Salem Branch of the former Pennsylvania Reading Seashore Lines. 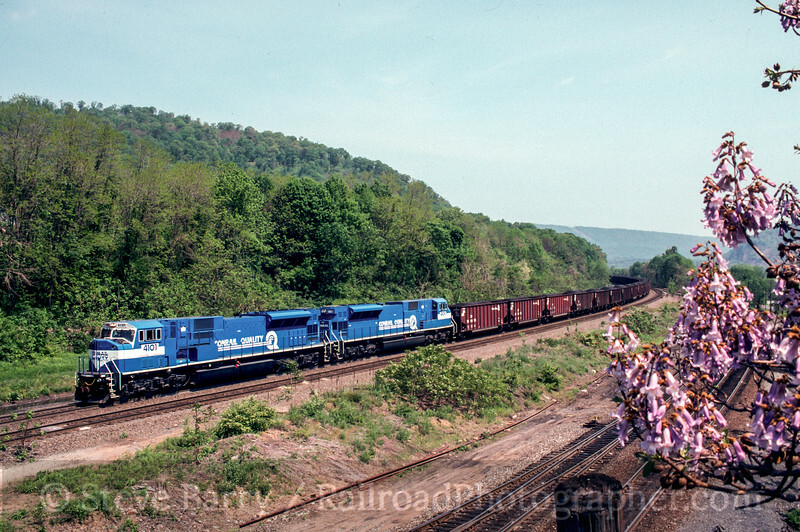 After merging into Conrail, this branch was spun off to the West Jersey Short Line, then the West Jersey Railroad, then the Southern Railroad of New Jersey, then U.S. Rail and then back to SRNJ. This RS3m was working the branch under the West Jersey Short Line flag on June 25, 1986. Note not one, but two large cast iron crossbucks protecting the crossing. Our third chrome features blue and gray (and yellow) from CSX Transportation. Certainly one of the most scenic regions east of the Mississippi River is the Hudson River valley north of New York City. This view is from the Bear Mountain Bridge, which carries U.S. 6 and the Appalachian Trail across the Hudson. This stack train has just popped out of the Fort Montgomery Tunnel on its southward trek on September 18, 1999. We finish off with a blue image. 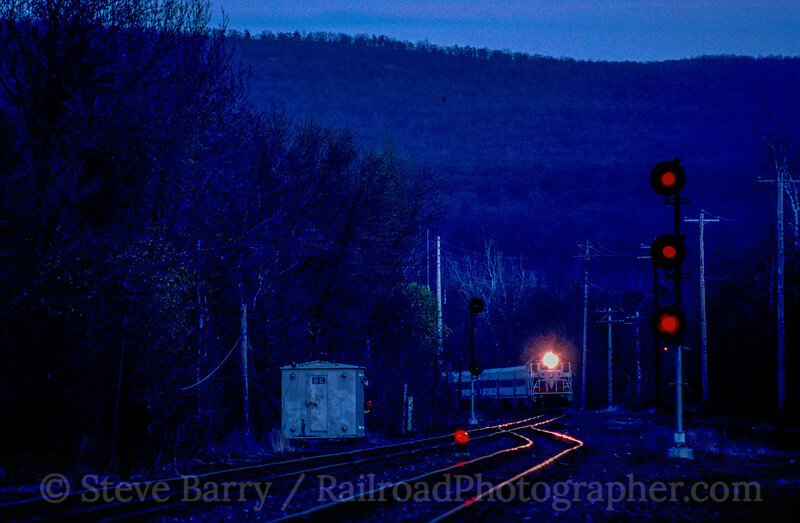 This westbound Metro-North train is minutes away from its final destination at Port Jervis, N.Y., on April 30, 1997. The sun has already set, allowing the headlight and signals to pierce the last twilight. Obviously that was supposed to say I only "like" trains that are blue. Good job, Emily.